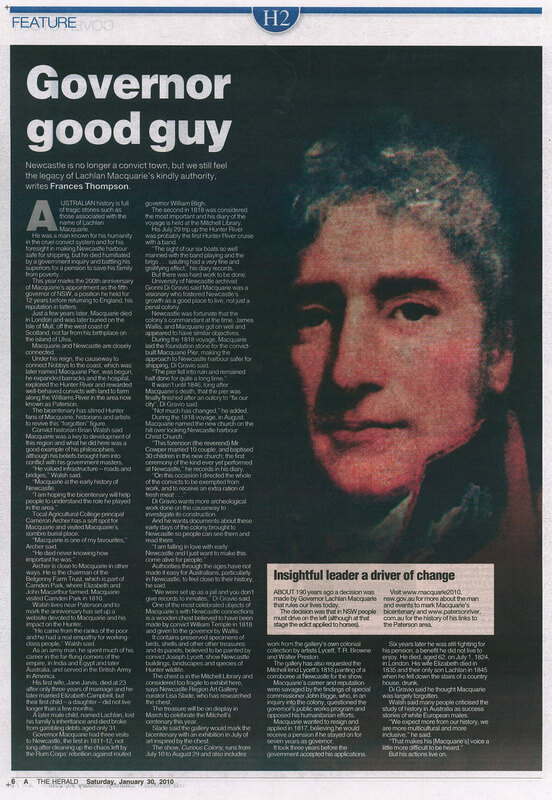 In recognition of Macquarie 2010, The University of Newcastle’s Coal River Working Party will embark on the quest to find the Foundation and Inscription Stone laid in Newcastle by Governor Lachlan Macquarie back in 1818, and believed lost for over 190 years. Macquarie Pier (or causeway) was initiated to make the harbour safer for shipping. 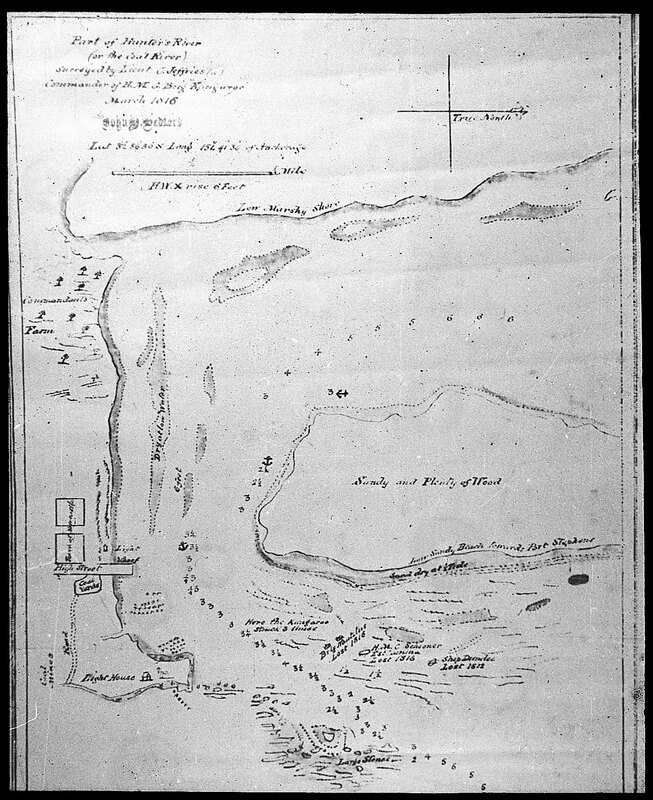 The Stockton oyster bank had become a graveyard for ships, as recorded in a map made by Lieutenant Jeffries in 1816, whose own ship, the Kangaroo, had accidentally struck three times when entering the channel. Lieutenant C. Jeffries. 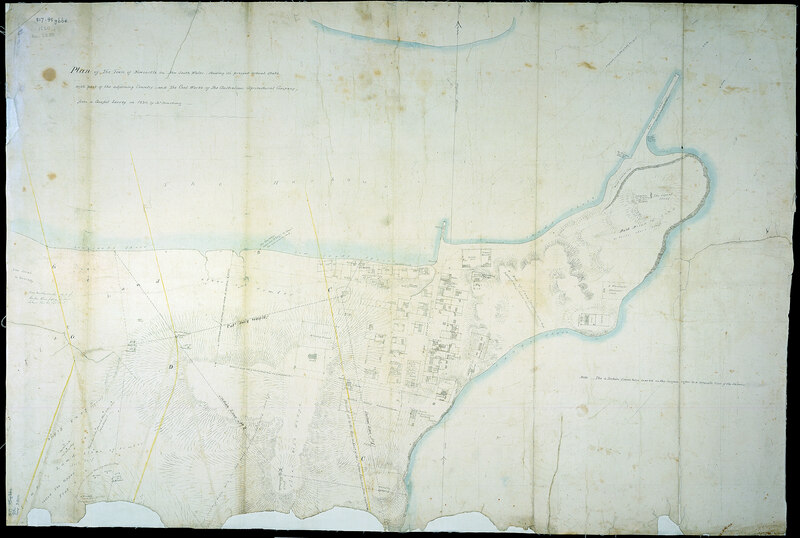 Survey of Part of the Hunter’s River (Or the Coal River), 1816. You can see from my map what a fearsome passage one has to traverse in order to reach this beautiful river. The roaring of the waves, crashing one upon the other and breaking with a terrible noise on the steep rocks of the island, and raging as they roll onto the sands of the opposite shore, would make the most intrepid sailor tremble. [If you had been here] you would have seen all the seamen, with terror showing on their faces but remaining firm at their posts, obeying with incredible dexterity their captain’s orders in order to extricate him from this almost impenetrable labyrinth. The doctor [Dr Harris] is a man who is truly necessary, for he is indefatigable in whatever he undertakes, and were it not for his great perseverance neither we nor the schooner would have entered the river that day. The Stockton oyster bank had become a graveyard for ships and so the visionary Commandant of Newcastle, Captain James Wallis sought a solution in the form of a causeway to link the mainland to Nobbys. It was on the Governor’s second visit to Newcastle in 1818 that it was decided to commence the construction of the Pier with a ceremonial laying of the Foundation Stone. On the 5th August 1818 the Governor was accompanied by Mr James Meehan, a surveyor, whose plan of Newcastle that he drew on 7 August 1818 shows the lines of the intended pier. 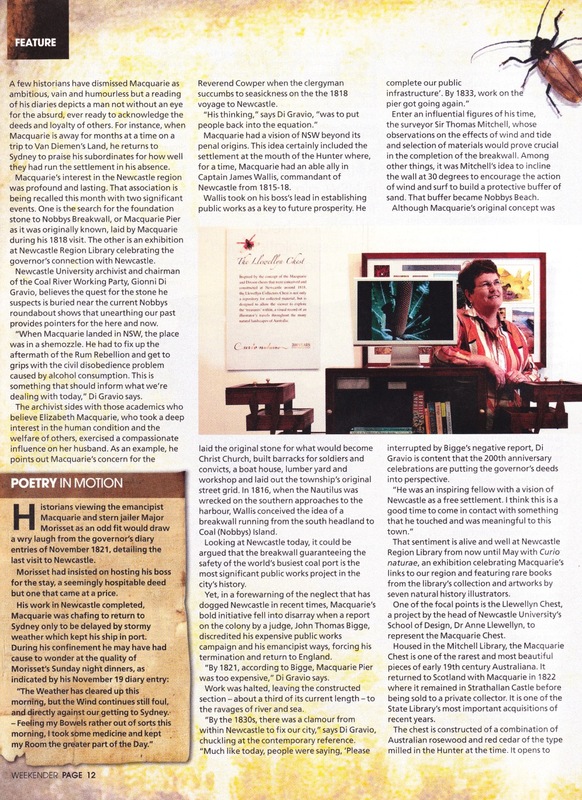 The original was recently located by our colleagues at New South Wales State Records in Sydney, and a beautiful new scan is displayed below. The overlay below is part of the colour Meehan map over 2006 aerial photograph. 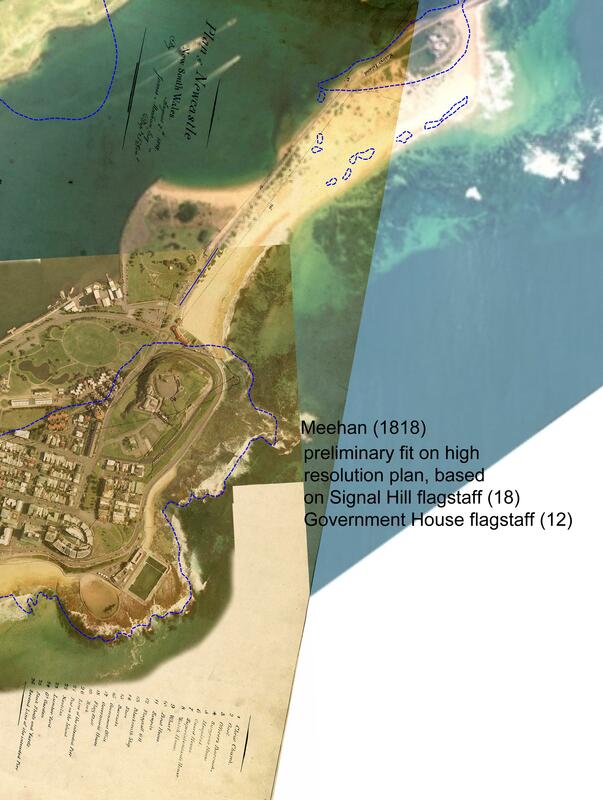 I used the Flagstaffs on Signal Hill (18) and at Government House (12) to relate the map to Armstrong – this gives good correspondence across the maps (1-2 m on recognisable buildings and features) and may only be improved if we can find Meehan’s original field books. 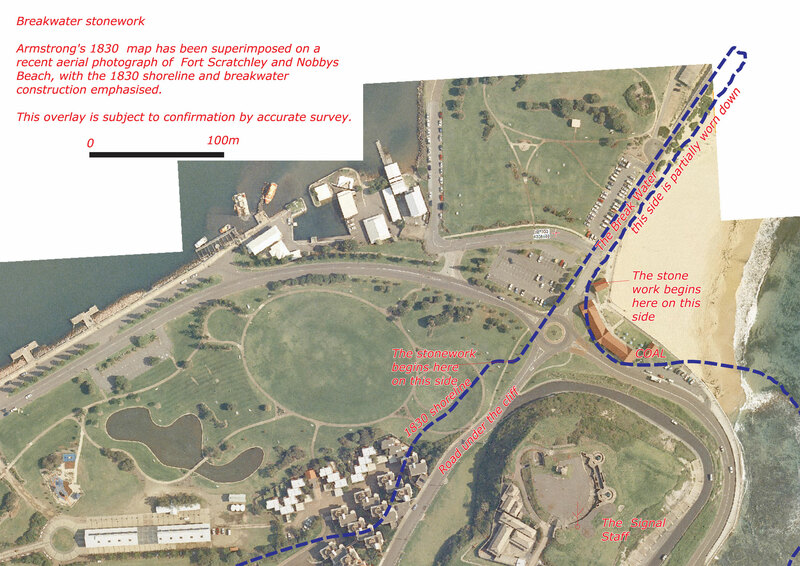 The station from which the lines of the intended pier originate is at the intersection of Fort Drive and Nobbys Drive, approximately 30m south of the “start of stonework on this side” on Armstrong’s plan. I think this means that we have a 30m line along which is the likely location of the foundation stone. 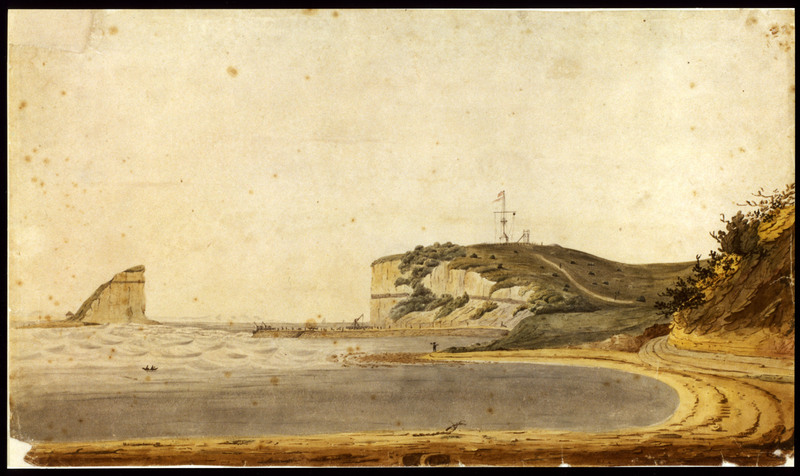 Work on Macquarie Pier began soon after the Governor’s visit and continued up until about 1823/4 when the project was discontinued because Newcastle had ceased to be a penal settlement, and Governor Macquarie was recalled back to England. Where exactly the foundation stone was laid is not known, many believe it was lost, but a map by the A.A. Company surveyor John Armstrong, drawn in 1830, indicates the point of commencement of the stonework with annotations on both sides of the Pier reading on the left “The stonework begins here on this side” and further along the Pier towards the present Nobbys surfhouse sheds “The stone work begins here on this side”. This plan is the key to possibly identifying the stone’s present location. This plan has been overlayed on a modern aerial view of the landscape to identify the target location to search for the Foundation and inscription stone. The following three overlays were prepared by Russell Rigby. After the withdrawal of the main source of convict labour to Port Macquarie in 1822, Newcastle was unable to continue construction of the pier. The Pier by 1830 according to Armstrong’s plan was ‘partially worn down’ on the ocean side. Shipping was increasingly becoming crucial to the town and so the settlers began a campaign to urge the Government to repair and resume Macquarie Pier’s construction. The latest work upon which Sir Thomas Mitchell was engaged is one which he did not live to see completed in its full integrity. 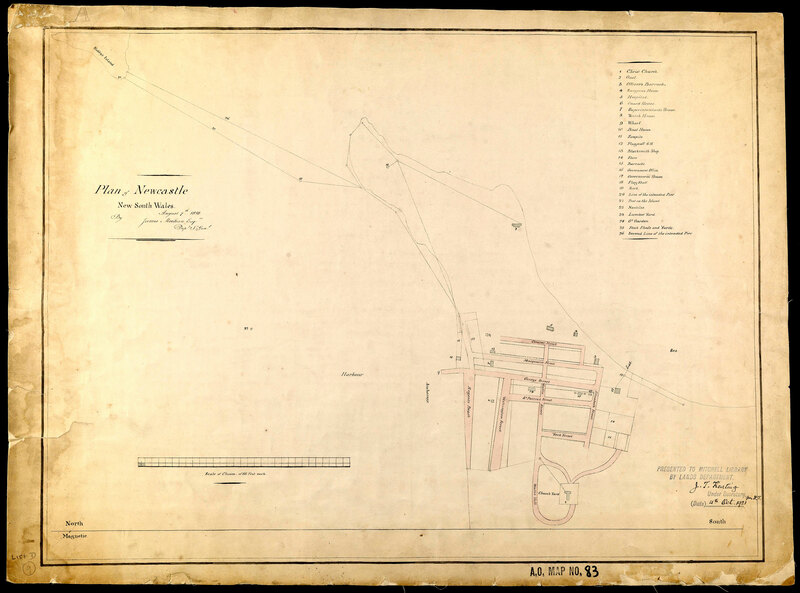 We allude to his Report upon the progress of the roads, bridges, and other public works of the colony, which, by a resolution of the Legislative Council in October last, the Governor-General was requested to instruct him to draw up. When presented to the Council during the present session, the report was ordered to be printed ; but some difficulty arose as to the expense of engraving the elaborate drawings which accompanied it. This difficulty was soon overcome ; for Sir Thomas, unwilling to have his report published without the illustrations, had them engraved at his own expense, and at the time of his death only two remained unfinished. We sincerely thank Deborah Brown, Manager, Reference & Information Resources for her exceptional service in providing relevant images to us relating to the Pier and its construction. 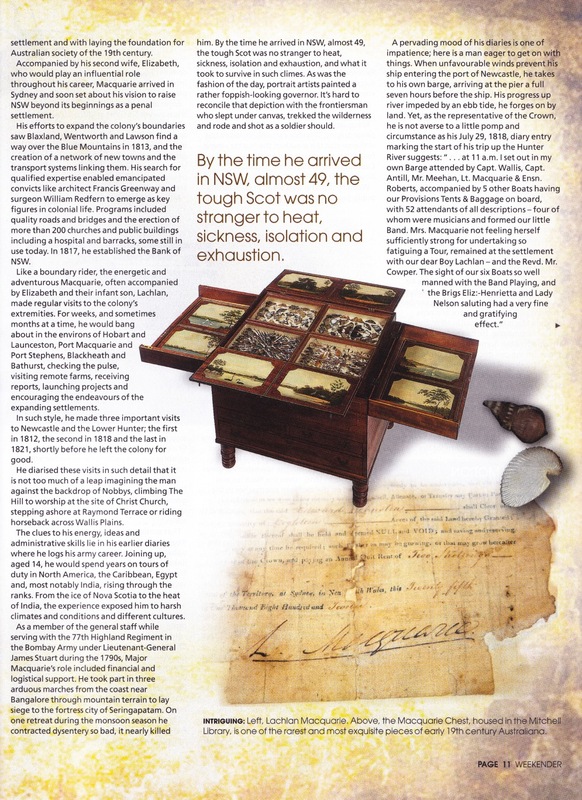 Pages 274 to 281 contain Mitchell’s report on the ‘Breakwater at Newcastle’ consisting of three transcribed letters (Nos. 33/31, 33/137 and 33/116) with the Colonial Secretary Alexander McLeay and Mr Charles Hopwood. There are two annotations in the margin. One is a letter number (33/313) and the other reads “originals to be retrieved”. Unfortunately if the letter number is a reference to Colonial Secretary’s Inwards Correspondence it has not been recorded in our skeleton register which means its survival (at least within this series) is unlikely. will examine what has been formerly done towards forming a Breakwater at Newcastle, and report your opinion, as to the best mode of proceeding. This mortar was formed from powdered unburnt limestone and coarse sharp sand, the whole being pointed with Puzzolana earth or Roman Cement, by which such embankments become as solid as rock and fully resist the effect of water: But with the clayey stone in the Newcastle Breakwater, it will be necessary to face the work with a harder material, especially on the side towards the sea, which should have an inclination of about 30 degrees. “Roman Cement” was developed in England between 1780-1796, and was actually nothing like any material used by the Romans. Puzzolano earth was volcanic ash used by the Romans an additive to cement, to strengthen concrete used on a large scale. Pozzolans may be natural ( eg volcanic ash) or artificial (ground up bricks, fly-ash). The Thames Docks were built between the years 1799 and 1815. Mitchell goes on to propose using ship’s ballast to build up the Pier, as well as lining the walls to create a beach to protect its ocean side. With the Governor’s allocation of funds from 1833, Mitchell appears to have been the architect of the Pier’s creation during this period up to its first completion in 1846. 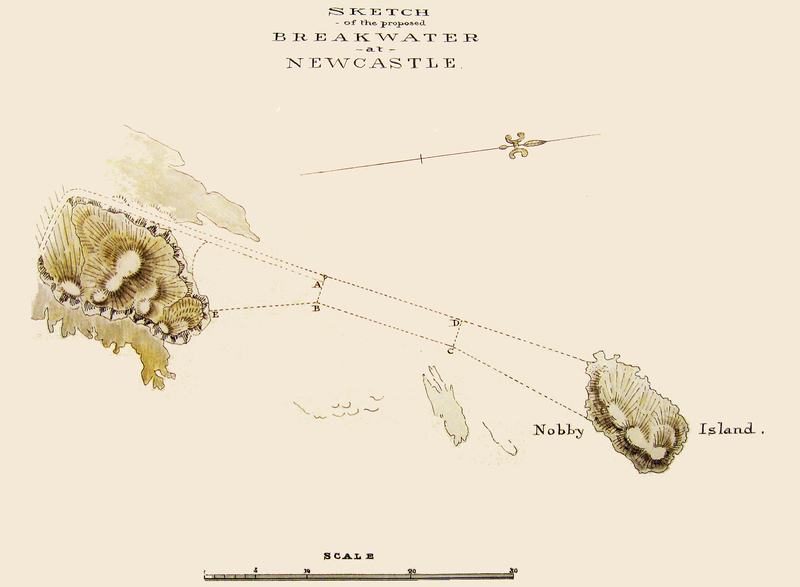 Sketch of the Proposed Breakwater at Newcastle by Sir Thomas Mitchell. Courtesy of the NSW Parliamentary Library. The scale and magnetic North on the sketch agree well with the overlay on the air photo – scale to within 1%, azimuth within 1/4 degree. The northeastern corner of Signal Hill needs to be checked, and compared to the Armstrong map and Mitchell’s 1828 observations. The first person to walk across the completed causeway was Mr Walter Scott, Clerk of Works. However the ongoing maintenance of the structure was a problem as the southern gales continued to undermine the structure. By 1866 Macquarie Pier was rebuilt, this time using stone quarried from Waratah and brought to the site by rail. The first delivery of quarried stone for the Pier arrived in 1869, and construction completed by 1873. Further extensions of the Pier to protect shipping from the reef to the Big Ben Rock were completed in 1883 and 1896 respectively. 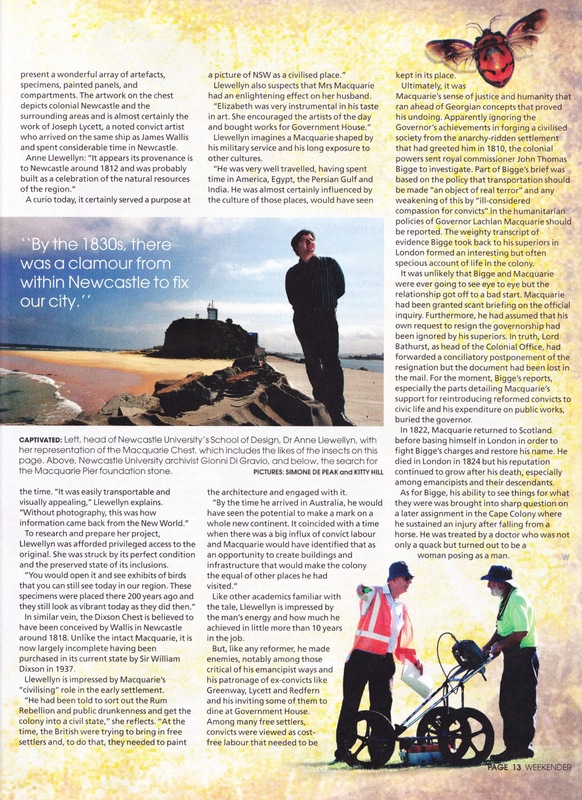 There is good evidence that the stone pillar shown on the Adams plan (1856) is actually the Bull Beacon, which was a navigation mark for the line of the north channel in Newcastle Harbour, close to the Stockton shore. The beacon is shown on harbour charts surveyed in 1851 and 1869. In 1851 the line of the channel was marked by the stone pillar and a white strip on the western face of the breakwater stonework – see sketch on 1851 plan. In the engravings by Terry, dated 1853, the pillar is shown on the seaward side of the breakwater, but no stripe is visible because of the angle of view. In Adams 1856 plan a “wooden beacon” is shown on the shore line on the harbour side of the breakwater, as well as the “stone pillar”. The pillar is shown 36m further towards Nobbys than the position of the Bull Beacon on the 1851 and 1869 harbour charts, so it is probably misplotted. There is little survey control along the breakwater until the Nobbys lighthouse was contructed in 1858, and there are problems with survey control on Signal Hill because the flagstaff and signal towers appear to have been moved several times. The form of the Bull Beacon is not shown on the 1869 chart, and by 1875 it is shown , in a slightly different postion, as red and white lights. The position of the beacon along the breakwater changed as the line of the north channel shifted south across the harbour due to dredging. The c1900 photo shows the Beacon as a squat tower on the harbour edge of the breakwater, with a leading light on a gantry over the water on the harbour side. 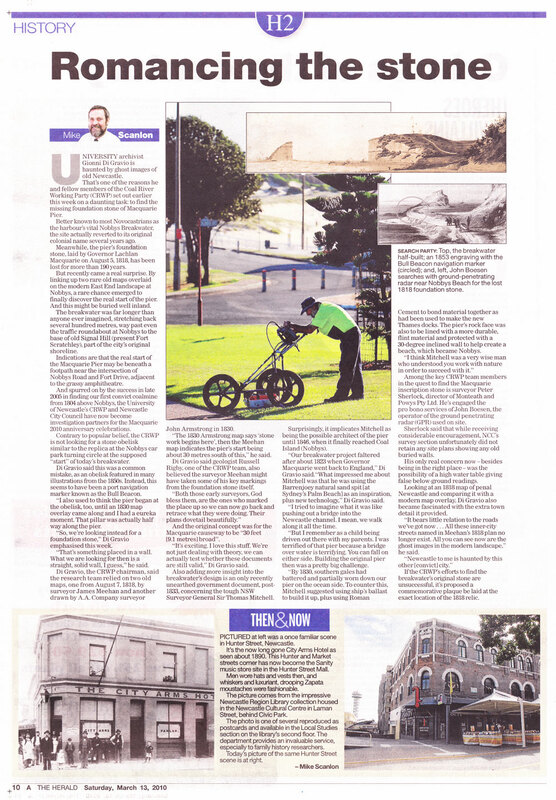 Later photos show a much taller tower, closer to Fort Scratchley – see 1911 chart, and 1938 photo and chart. One of the current channel markers is between the 2 Nobbys Beach car parks, about 150 m south of the original Bull Beacon position. 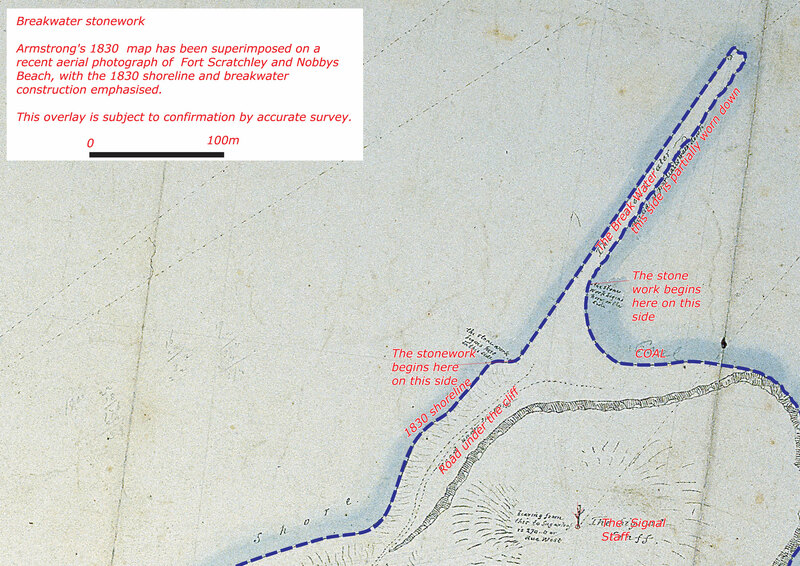 The original Bull Beacon position is very close to the end of the breakwater construction shown on Armstrong’s 1830 plan, and March 1834 extent of construction shown on the 1844 plan. This may be coincidental, as there is no indication of the Bull Beacon or other navigation marks in this area on the 1844 plan. I have not researched the original of the name “Bull Beacon”, and the name does not appear to be in use any more by pilots or the Port Authority. From overlays of the 1830 Armstrong plan we believe this to be somewhere in the vicinity of the footpath adjacent to the grassy amphitheater near the Fort. If this process locates the start of the stonework then great, if not we might need to excavate a trench. We are undertaking a services search as part of the preparations for radar survey. I believe our existing pro bono radar provider John Boeson will be able to achieve a similar depth profile to that described by John’s demonstrator provided we do not encounter further problems with water table. I have received considerable assistance & encouragement from all levels of NCC. Unfortunately their survey section do not retain any site plans showing old walls etc. We are in possession of Russell’s overlay plan of the original walls & intend to paint mark the old alignment onto the site. I propose a target date for radar survey in the week commencing Monday 08/03/2010. We will prepare a risk assessment for site survey works & submit to council for review prior to commencement. We have received some fantastic support from local archaeological firms, the Land and Property management Authority, the Department of Environment & Climate Change and the Newcastle City Council. A proposal was prepared for the Surveyor General for the attention of the Minister on 22 April 2010. We are delighted that an official announcement on the formation of a ‘Newcastle Team Team’ will be made at the end of June 2010. We are delighted to announce that the Hunter Manning Group of Surveyors and Emeritus Professor John Fryer have kindly provided the funding for a commemorative bronze marker to be laid in the pathway adjacent to the beginnings of the stone work for the Pier. A ceremony is being planned for the 4 August 2010 at 4pm, so please stay tuned. On the 29th July 2010 the bronze marker plaque arrived in Newcastle and it looks fantastic. It is actually made of a manganese bronze, and is the colour of a golden brass. 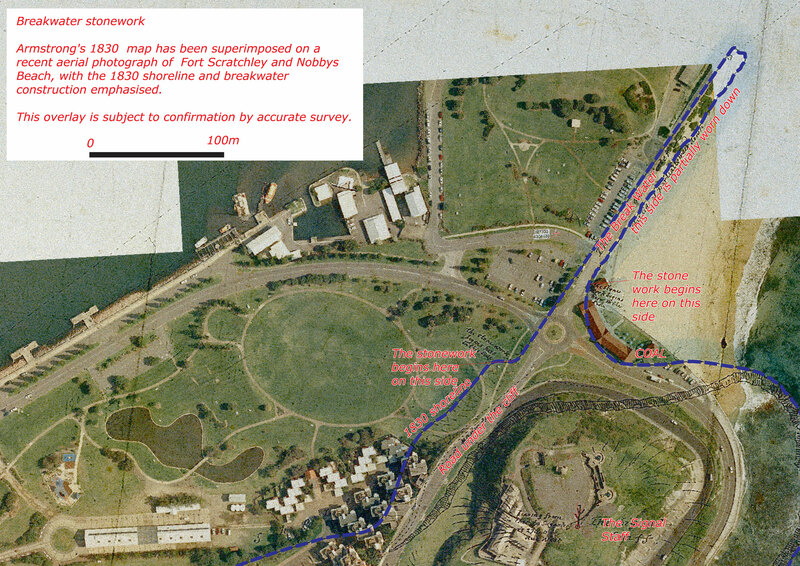 Description: A group is hoping to unearth 192 years of history by digging up part of the Newcastle foreshore. 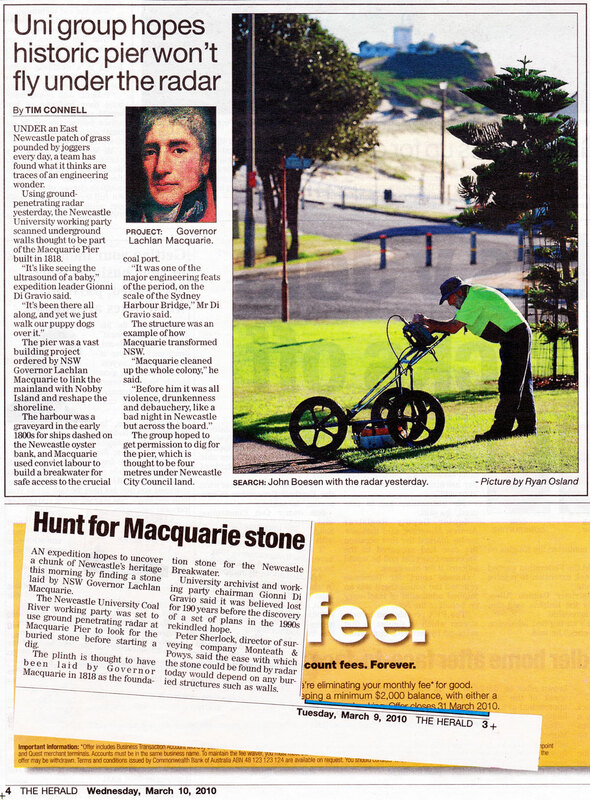 It’s looking for the foundation stone of Macquarie Pier, and may just have found it. Following this with interest, and wishing you good luck and success. There are a couple of Henry King photos of this area of Newcastle (c. 1880 – 1900) in the Tyrrell collection at the Powerhouse Museum which you might not know about. The ‘Zoomit’ function shows great detail. They might be useful. The real question is: would the convict pier have been uprooted for these buildings? My belief is that they would have left it in place and built on top of it. What do you think? I am so pleased the photos are of interest. 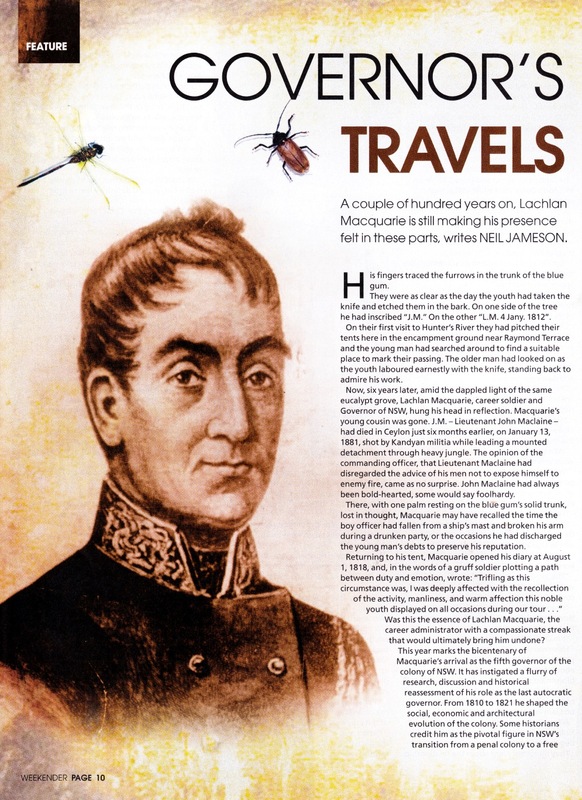 I was wondering if the ‘Bull Beacon’ mentioned above might have been named for Captain John Edward Newell Bull? 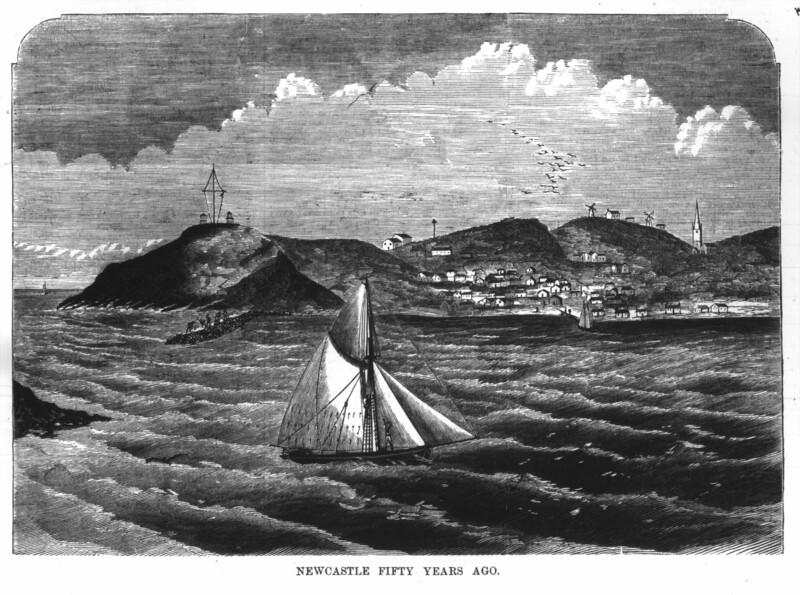 Captain Bull and Captain Livingstone were commended for their efforts in improving Newcastle harbour and wharf in 1850. 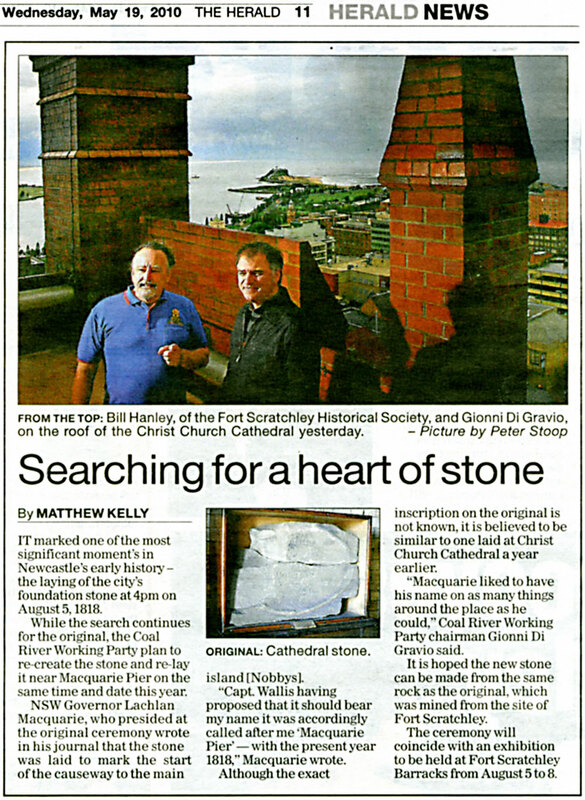 There is an article about the improvements in the Maitland Mercury on the NLA Historic Newspapers site. I recently came across another view of the Pier, earlier than the Henry King one above, at least pre 1881. It may be of interest. Oddly enough there is a mark on the print where the stone might have been. The image you refer to in your 17 March comments is post 1885. It would be late 1890’s or possibly very early 1900’s. Its a wonder the boys at Fort Scratchley could not have dated this picture as the clues are within the Fort. I guess there might be a historian or two within the museum group? The image you guessed as being pre 1881 in your 20 April comments is close. The picture would have been created around 1878 as a predecessor of part of the Customs House is visible for those with good vision or a magnifying glass. It would be nice if rather than looking for a “fictional stone” on the “assumed end of the breakwater” some time was dedicated to the “stone” that appears in photos on the Nobby’s end of the “actual” breakwater. The site is now occupied by a round slab of concrete. What was the concrete slab used for I have been asked? I have the answer but what I am yet to confirm is near the slab and might be related to coal mining beneath Nobby’s. Where is the Powder Magazine beneath Fort Scratchley and what is the oldest surviving and visible structure within the Forts walls? I just like the valuable information you provide for your articles. I will bookmark your blog and take a look at again right here frequently. I’m moderately sure I’ll learn a lot of new stuff proper right here! Good luck for the following!